These days my closet is, how shall we say, a hot mess. It happened completely by accident. Normally, the weather gets cold, snow falls, and I quickly usher my summer wardrobe away in exchange for its winter counterpart. Blame the unseasonably warm fall, the flurry of pre-holiday events, the crazy that is my life and well, there you have it, an enter at your own risk closet filled with multiple seasons of unfolded pieces and disorganized accessories. I considered sharing a picture...but quite frankly, my mother would be disappointed. I take everything (yes EVERYTHING) out of my closet and pile it on the bed. This usually induces a mini panic attack. Don't be intimidated and remember, wine helps. Once everything is in plain sight, I go through the pile piece by piece and evaluate whether each item is something to keep or purge, separating my closet into two piles. Keepers are items that have been worn in the last 6 - 12 months or are new items that I'm pretty sure I will wear in the next 3 - 6 months. Purge items are those won't realistically be worn in the next 6 - 12 months because they're too small, off trend, or just no longer excite me. Taking stock of my keepers, I figure out whether or not I still have the right "tools" to keep my closet in check. No drills required unless you're going high tech and installing custom shelving which is totally awesome but not necessary. Scout home decor websites and blogs for ideas and head to Ikea for affordable hangers, storage bins, shelving etc. to get the job done. I am by no means a professional but I prefer wooden hangers to plastic or wire because they space clothing nicely so I can see everything in view. I'm a big fan of organizing by colour so it's easy to find items plus I fold and stack sweaters on easy to reach shelves, and place lesser worn items up high out of the way. I do have a separate closet for bags and shoes which I store in clear plastic boxes (poor hubby stores his clothes in the guest room). If you're short on space or have a spouse who cares about closet space, check out over the door cubbies for accessories. Next I start putting everything back in it's place folding neatly, organizing smaller items into storage containers and so on, but I also take this opportunity to do another edit of what I've chosen to keep. Sometimes, I'll even take a minute to create some new looks to prove that an item will carry it's weight in the months to come. If I can't figure out at least two ways I'll wear something, it's quickly banished to the purge list. Now I quickly remove the purge pile from my house. Do not underestimate the ability of cast offs to wiggle their way back into your closet the longer they stay at home! The day closet order is restored, I make a call to my charity of choice to arrange pick-up or an appointment to drop-off of items I want to donate. If you have valuable designer duds to purge, try consignment shops or clothes swaps, where you can get cash or new pre-loved treasures in exchange for your gently worn pieces. Depending on the size of your closet and your addiction to fashion this process can take as little as a few hours, or as long as a couple days. If you're short on time, or really suffering from an overstuffed closet, you may want to consider working with an image consultant to help you figure out what to keep, or professional organizer to help you figure out how to get the best use of the space. A stylish friend who you can pay with chocolate also works if you're on a budget. Closet overhauls are a chore, but don't tackle it by yourself if you truly need help! 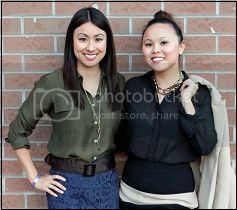 -- Tamika Auwai is a fashion junkie, splurge-a-holic, and founder of Shop Socials. The Ikea Pax System is an organizer's heaven! You can cost-effectively customize any closet (small to large walk-ins) with all sorts of shelves, drawers, shoe display racks, doors, etc. They fit perfectly into the space so it doesn't look like you bought some tacky out-of-the-box organizer. For an extra 20% of your bill, they will deliver it and even come with their allen keys to help with assembly! I love the container store. OMG is that Tamika's closet??? Mega jealous! I love closets that are like how you would want a boutique store to look like. Donating to charity is good. I like to donate to Salvation Army b/c they help provide jobs for people, they donate to homeless shelters, help victims of human trafficking, bring kids to summer camp, & they help promptly when there's a natural disaster. they support many good causes. Otherwise I think Good Will is a good & dependable organization too! pick-up is pretty convenient, but if I'm not sure when I'll be hope they driving to a donating centre is pretty easy too. I wouldn't sell my clothes on ebay/2nd hand store unless it's super designer such as LV, Burberry or Valentino. If it's just from the mall then I rather save time and do a good deed. I want to super organize everything like that. Even my nail polishes & makeup I need racks & such things. Thanks for the post. It's advice I prob know already, but I like to see how others do it.